Rep. Tom Suozzi has his head shaved for St. Baldrick’s at the Downtown Cafe in Glen Cove (Photo courtesy of Jacob Scheiner). Rep. Tom Suozzi (D-Glen Cove) lost his hair on Sunday, but he was able to gain thousands of dollars in donations to fight childhood cancer. 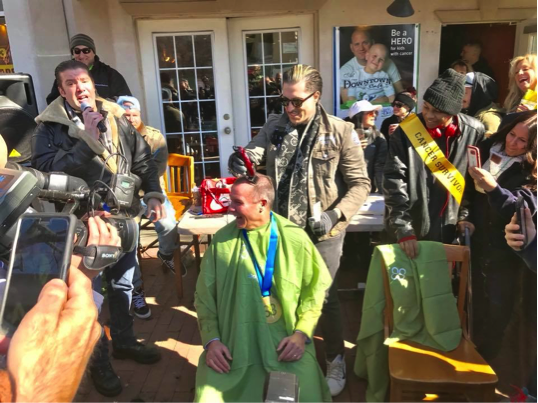 The congressman and former county executive had his head shaved as part of the annual St. Baldrick’s Day foundation event at the Downtown Cafe in Glen Cove. “I was nervous right before they took the razor to my head, but that is nothing compared to what these kids and their families go through everyday fighting this terrible disease,” Suozzi said. Suozzi raised $12,000 on Sunday, which was split evenly between the St. Baldrick’s Foundation and the Nicholas J. Pedone Foundation. 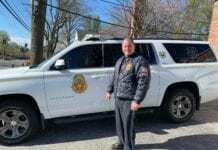 The latter is named for a Glen Cove boy who was diagnosed with a rare form of childhood cancer. 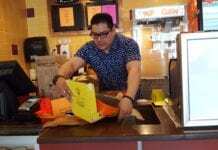 His parents started the foundation after his passing to raise money for childhood cancer awareness and hospital outreach projects, working directly with children who are diagnosed with the disease. Congressman Suozzi after his St. Baldrick’s head shaving (Photo courtesy of Jacob Scheiner). events similar to the one on Sunday, where volunteers agree to have their heads shaved to raise awareness. Since 2005, the St. Baldrick’s has raised $232 million. “If I am able to raise awareness and money to help combat childhood cancer, then I am happy to do it,” Suozzi said of his new trim. Not everyone was a fan of Suozzi’s haircut. His opponent in the Democratic primary, Joshua Sauberman, criticized Suozzi on Twitter for his refusal to support a single-payer healthcare system. “I fought cancer & won, but @RepTomSuozzi continues to fight cancer patients, who want a healthcare system that ensures they don’t have to choose [between] buying groceries or receiving life-saving treatments. Tell Tom that 92% is not good enough. Let’s pass #SinglePayerNow. #JoshForNY,” he wrote in a Tweet on Sunday. Sauberman was diagnosed with metastatic prostate cancer in 2009. He told Blank Slate Media last month that he was denied coverage by his insurer who said the cancer was a pre-existing condition. He said that ordeal inspired him to run for Congress this year.